GE Mosquitoes To Be Released in Florida Keys – Again! I first wrote a post on January 11, 2012 about an upcoming release of 5,000-10,000 GE (genetically engineered) mosquitoes that were to be released in Key West near the cemetery and my childhood friend’s house. The citizens rallied and the mosquitoes luckily were not released. Here it is January 11, 2015, 3 years later, and I can’t believe I am writing about it again! 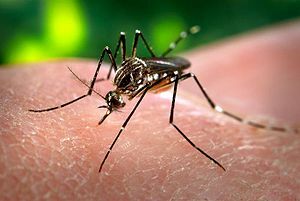 The same company, Oxitec, a UK biotechnology firm, is again planning the first US release of genetically engineered (GE) mosquitoes, possibly as early as February, 2015! This time however the location is Key Haven and this time they plan to release approximately 3 to 4 million sterilized male aedes aegypti (aka yellow fever) mosquitoes and this is supposed to be just a trial! In late October, 2014 Oxitec began remodeling a 400 square foot room in the Marathon office of the Florida Keys Mosquito Control District. This is to be the “mosquito-rearing” location for Oxitech at a cost of $20,000 to remodel the room. Of course this is all in anticipation of the FDA approving the GE mosquitoes. A town hall meeting was held on December 4, 2014 to answer questions from the public. If you want to listen to the 2+ hour video with all the questions the residents had you can view it on the Florida Keys Mosquito Control District’s Facebook page. It was interesting to listen to answers like “No, it is not a done deal yet. The FDA will be analyzing the results after the trial release of the mosquitoes. If something develops other than a red bump on the skin the FDA will not approve the release of any more mosquitoes”. WHAT??? 3 to 4 million GE mosquitoes released and THEN the FDA will make a decision…seriously? Here’s the part I love..Oxitec plans to alter male mosquitoes to make them “sterile,” so when they are released and mate with a female mosquito in the wild, her offspring would die in the larval stage. So what happens to humans when bitten by one of these mosquitoes? Why isn’t Oxitec doing this in the UK instead of the Florida Keys? Maybe they don’t have mosquitoes in the UK…so why would Oxitec want to embark on this venture? We all know the reason but why in the US and why in Florida? To say, as a rebuttal, that these GE mosquitoes are safer than the pesticides now used, is frightening in itself! I, for one, will not be going to the Keys again if these GE mosquitoes are released as a trial. I’m not interested in becoming a human experiment for GE toxins. I feel awful for the 249 residents of Key Haven who may or may not realize the consequences of such a trial…anyone remember the “love-bug” experiment in a remote central location of Florida? Now those love bugs are all over the state and a major nuisance! Lucky for us they were not GE love-bugs! …like these mosquitoes wouldn’t fly or travel past Key Haven? Next ›Top 15 Green Builders In Florida To Be Recognized!